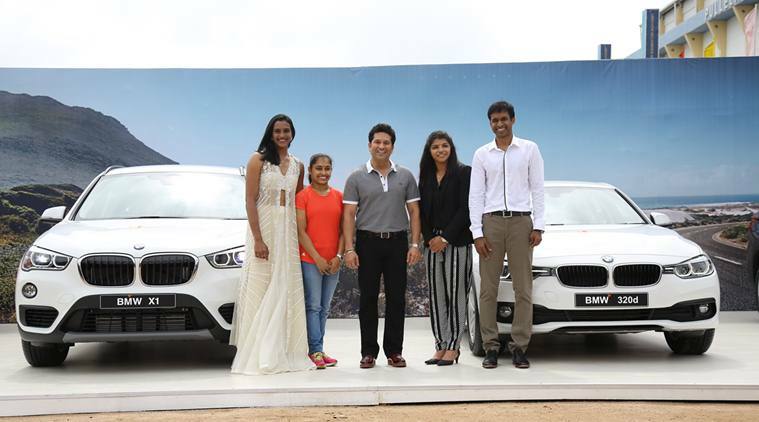 Rio Olympics silver medallist shuttler PV Sindhu and bronze winner grappler Sakshi Malik along with gymnast Dipa Karmakar and badminton coach Pullela Gopichand were today presented BMW cars by cricket legend Sachin Tendulkar. Tendulkar, who was the Goodwill Ambassador of the Indian team at Rio Olympics, handed over the keys at a function at Gopichand Badminton Academy here. “This is a wonderful moment for Indian sport. Journey begins here, I am sure this doesn’t stop here, we all will be joining that journey and are there to support you. You will keep us giving number of occasions to celebrate,” Sachin Tendulkar said. “The entire nation is happy at this moment and jumping with joy, there are greater things to come,” he further said. “Gopichand you have been a wonderful role model, you have gone a notch higher. We all admire you. You are a real hero. We need your guidance in getting more medals. I thank various other coaches also,” the batting maestro said. “On behalf of the entire nation, I can say that all these sports persons standing beside me have brought laurels to our nation. I thank everyone for supporting and praying (for sports persons) that is what an athlete looks out for,” he said. Be the first to comment on "Sachin Tendulkar gifts BMW to PV Sindhu, Sakshi Malik, Dipa Karmakar, coach Pullela Gopichand"